Join us for Edgewood Borough's Annual Easter Egg Hunt! Edgewood's Annual Easter Egg Hunt will take place on Saturday, April 13 at noon at Koenig Field. Children ages 2 to 10 are welcome to bring their Easter baskets and collect as many eggs as they can find! We are happy to see this fun tradition continue throughout the years. Join us for a lovely day of fun! During these cold and snowy winter months, Edgewood Borough would like to remind our residents of a few tips to help us get through the winter. Please remember to keep your sidewalks clear of snow and ice. This not only helps keep Edgewood a walkable community, but un-shoveled sidewalks look like no one is home and could be a tip to would-be burglars. Check in on your neighbors, and even offer to help shovel for someone who is unable to do it themselves. Our public works crews are working hard to keep our streets salted and plowed. Please help them out by not shoveling snow back into the roadway. If you park on the street, please park as close as possible to the curb to allow us to treat the roads. Tuck in your side mirrors, too! When walking your dogs, please continue to pick up after them even when there is snow. Most importantly - stay warm and safe! Attention All Residents: Leaf collection will be ending for the season on Friday, December 21. During the last week, crews may deviate from the published schedule to attend to the areas most in need of collection. Please refrain from placing any additional leaves at the curb next week-they will not be collected! Please note: on wet and rainy days, leaf collection takes extra time and is sometimes not possible. It is recommended residents bag their leaves for pickup by the trash collector. Thank you for your patience and understanding. Our crews dealt with unusually bad weather this season which forced us to modify our collection routine. 2019 Parking Permits will be available for purchase at the Borough Office at 2 Race Street starting Monday, December 3. Pick yours up before the 2018 permits expire on January 2! Mayor Wilson has lifted the Overnight Parking Ban effective Wednesday, November 21 through Sunday, November 25. 2019 Borough parking passes will go on sale December 3, 2018. For more information and to download our 2019 Parking Permit Application visit our Parking Permit Page. A public hearing on the proposed 2019 General Fund, Sewer Fund, and Highway Fund Budgets will be held on December 3, 2018 at 7pm in Council Chambers. Draft copies of the 2019 General Fund, Sewer Fund, and Highway Fund Budgets are available for inspection at the Borough Building between 8:30 am and 5 pm; The C.C. Mellor Memorial Library; and digitally by clicking here. 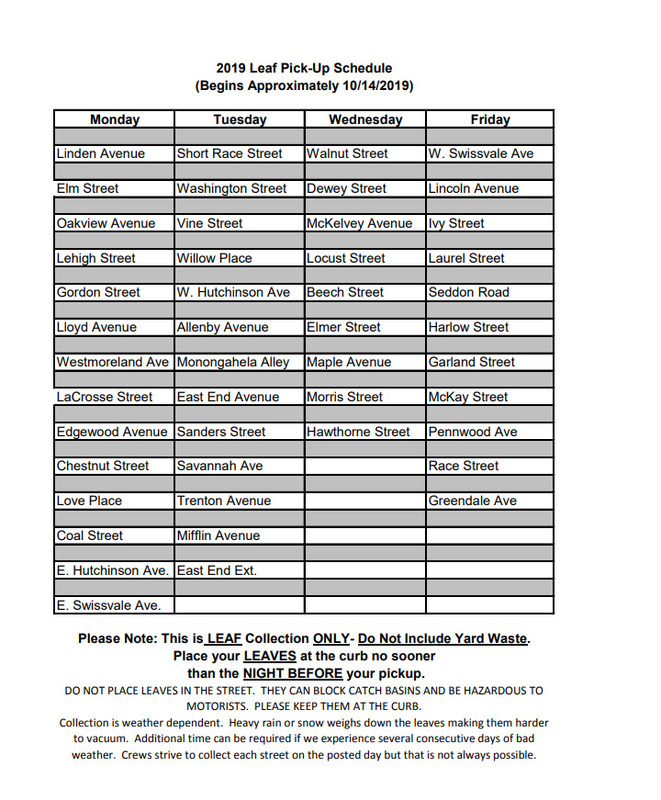 Leaf collection will resume regular collection starting Monday, November 26 (weather permitting). Volunteers are needed for Edgewood Borough’s Civil Service Commission and Planning Commission. The 2019 Edgewood Borough Budget meeting will be held from 8am-Noon this Saturday, Nov 17 in Council Chambers at 2 Race Street. This meeting is open to the public. Join us for Tai Chi in the Park, the newest addition to our fitness offerings for adults in Edgewood. All classes will take place in the Field House at Koenig Field at 301 Greendale Avenue, Edgewood PA 15218. Jon Wilson leads this class Mondays from 7:30-8:30pm January 7 through February 25. Be sure to wear loose-fitting, comfortable clothing. If you have any questions, contact Jessica at office@edgewoodboro.com or 412-242-4824 We hope you'll enjoy this peaceful time to center yourself! About the Instructor: Jon is the Assistant Instructor at Steel Dragon Martial Arts in Lawrenceville. He teaches an after-school Kung Fu program at Reserve Primary School in Shaler as well as ongoing classes at Shepherd Wellness in Bloomfield. He trains and teaches in several different styles of Kung Fu including: Wu Style Tai Chi, Ying Jow Kuen, Bagua Zhang, and Xing-Yi Quan. In 2012, he became the Senior Disciple of Chris Young under the Yin Cheng Gong Fa lineage. The world's deadliest influenza pandemic - sometimes called the "Spanish Flu" or "the Gripe" - swept through Pittsburgh and the region in the fall of 1918. Among those charged with trying to slow it down and save lives was Dr. Adolph Koenig - the medical supervisor for Allegheny County and a noted Edgewood resident. The first officially recorded flu death of a Pittsburgh-area resident was on Oct. 5, 1918, though it is believed an increased number of pneumonia deaths in the weeks prior actually were flu-related. Pittsburgh had the highest death rate of any major U.S. city that year. More than one in every 100 people died, which was twice the national mortality rate, according to the U.S. Centers for Disease Control and Prevention. At its height, someone in Pittsburgh came down with the flu every 70 seconds and while the virus killed someone every 10 minutes. Dr. Koenig suggested that people gargle several times a day with "a tablespoon of salt and one of baking powder in a glass of water," according to "Pittsburgh in the Great Epidemic of 1918." He also recommended that people avoid alcohol as well as eat and drink moderately. Doctors in 1918, however, knew nothing of viruses. It is estimated that about 500 million people - or one-third of the world's population - were sickened and that at least 50 million people died worldwide, according to the CDC. Some 675,000 of those deaths were in the United States. Pittsburgh hospitals treated nearly 24,000 people for the flu, and more than 4,500 residents died, according to data from Pittsburgh Mercy Health System. One of them was Dr. Koenig's son, Eugene. He was 20 years old. The Edgewood Historical Society will discuss the 1918 influenza pandemic and Dr. Koenig from 6:30-8 p.m., Nov. 7, at the Edgewood Club. Please join us. Girls and Boys ages 6-15 are welcome to play, and there is no need to be an Edgewood resident to play with us. Registration begins on November 1 and ends on December 5. Registration fee is $60. Play begins on January 2 and the season lasts until the first week of March. It’s a great way to stay active during those winter months! All practices and games are held at Edgewood Primary Gymnasium, and are subject to school closings in cases of inclement weather. Click this link to register: https://go.teamsnap.com/forms/150986. Click Here for an informational flyer with all the details about Edgewood Youth Basketball. The Tree of Life Synagogue accepts donations directly through its website https://www.tolols.org and Dor Hadash through its website http://dorhadash.net. The Hebrew Immigrant Aid Society offers legal assistance, psycho-social care and safe economic opportunities for refugees of all religious backgrounds. You can donate to HIAS through its website https://www.hias.org. There is still a need for O-positive, O-negative and platelet donations. Appointments can be made by calling Vitalant (formerly Central Blood Bank) 866-366-6771 or the Red Cross Pittsburgh: Phone: (888) 217-9599. And, you can be KIND. Every Day. To Everyone. Practice KINDNESS; teach KINDNESS. Take the time to get to know your neighbors, care for them, and remember that we are all neighbors to one another. Unfortunately, the Borough's leaf machine is badly damaged and in need of extreme repairs. Leaf Pickup is delayed until further notice. We ask that you please bag and dispose of your own leaves during this time. Join us this Saturday for Fall Festival at Koenig Field! Originally set for Saturday, Oct. 20, we rescheduled due to heavy rains last week. 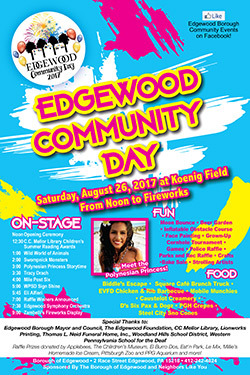 So there’s another chance to join us for this Edgewood tradition! Of course, cider and cookies will be served thanks to the Edgewood Foundation, Hayrides will be provided by the Edgewood Volunteer Fire Department, and crafts and games will be held in the field house. Join us Saturday, Oct. 27! Officer Bryan Wyke, Officer Frederick Livingston and Mary Leigh Scuilli were honored at the October 1, 2018 Council Meeting. First, Officer Bryan Wyke was honored for his immediate response that saved the life of choking infant. Mayor Wilson proclaimed October 4, 2018 "Officer Bryan Wyke Day" in Edgewood. Second, Officer Frederick Livingston was honored for his longstanding commitment to Edgewood, for his dedication in organizing the Citizen's Police Academy and receiving training to become a Juvenile Officer and for receiving a Master's Degree in Criminal Justice. Mayor Wilson proclaimed October 5, 2018 "Officer Frederick Livingston Day" in Edgewood. Last and certainly not least, Mary Leigh Scuilli, also known as Mrs. Scuilli to all the current and former students in Edgewood, retired this year, after serving 47 years as a beloved Crossing Guard. Mrs. Scuilli's fine work, dedication and true love for all Edgewood students was well known. Mrs. Scuilli will be missed, but we were honored to have her service for nearly half a century. Mayor Wilson proclaimed October 3, 2018 "Mrs. Mary Leigh Scuilli Day" in Edgewood. Construction of the Sanders Avenue crosswalk at S. Braddock Avenue begins tonight at 7pm. Construction will run 7pm-5am tonight until Saturday morning and then Monday night through Friday morning starting next week and run through at least October 19, 2018. Improvements include pedestrian islands, signage, and lighted signals. Thank you for your patience. The Edgewood Police Department is accepting applications for a Crossing Guard. Interested candidates should fill out an application and deliver it to the Edgewood Municipal Building located at 2 Race Street, Pittsburgh, PA 15218, Attention Chief Robert Payne. Applications are also available at the municipal building. Please be aware that leaf pickup is not possible on rainy or wet days. Do not place yard waste at the curb - the machine can only collect LEAVES. Branches and other debris can damage the machine. Leaves are collected in the Borough to protect our sewers and waterways from clogging and overflow. Leaf collection ends in mid-December, depending on weather and when the first snow arrives. Click here to download the 2018 Leaf Pickup Schedule. Flu vaccines will be provided free of charge at the Borough Building at 2 Race Street Edgewood, PA 15218. Shots are available at a first-come first-served basis for people 18 years of age or older through the generosity of the McKeesport Hospital Foundation, UPMC East, UPMC McKeesport, UPMC Health Plan and Eastern Area Prehospital Services. Influenza (Flu) vaccines contain the H1N1 vaccine. Keep our community healthy and get your FREE flu vaccine at the Borough Building this season! Flu shots will not be given to pregnant women in their 1st trimester. Attention residents of Dewey Street: Peoples Natural Gas Co. will be replacing lines on both sides of the street over the next 30-40 days. Please pardon the inconvenience this work may cause. Peoples will repave the sidewalks and entire street as part of their restoration. Mayor Wilson lifted the parking ban effective Friday, December 21, 2018 through Weds January 2, 2019. Cars parked on the street after 5am Thursday, January 3 2019 will be ticketed. Would you like to help serve your local government, and have a voice in choices made in your neighborhood administration? Right now, there are openings in both the Civil Service Commission and the Planning Commission in the Borough of Edgewood. The Civil Service Commission oversees and creates the policies and procedures for the Edgewood Borough Police Department. The Planning Commission oversees the administration of zoning and building within Edgewood. If you have any questions, or would like to submit a letter of interest and a resume, please contact Borough Manager Rob Zahorchak at manager@edgewoodboro.com or call 412-242-4824. We hope our residents will be proud to be involved in our community! Support the Edgewood Volunteer Fire Department by going out for a nice dinner! 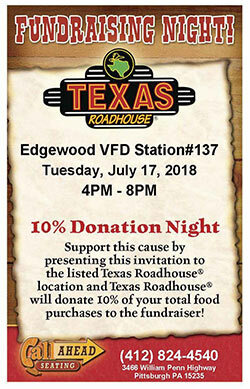 On Tuesday, July 17, The Texas Roadhouse will donate 10% of your purchase price to EVFD! Soccer is played in September and October each year, the practices and games are held at Koenig Field in Edgewood. Boys and Girls aged 4 to 14 are welcome to register. Registration Fee is $65. Registration begins July 5 and ends the second Monday of August. If you have questions, or would like to volunteer as a coach, please email office@edgewoodboro.com. Mayor Wilson has lifted the on-street parking ban for the 4th of July Holiday. The ban is lifted beginning Wednesday, July 4 at 3 am. Ticketing will resume Thursday, July 5 at 5 am. Pittsburgh, PA – PennDOT District 11 is announcing preparatory work on the I-376 Parkway East Longitudinal Repair Project in Allegheny County, will begin Monday night, July 2 weather permitting. Single-lane restrictions will occur in both directions on I-376 in various locations between the Edgewood/Swissvale (Exit 77) and the Pennsylvania Turnpike in Monroeville weeknights from 10 p.m. to 5 a.m. through Friday night, July 6. Crews will conduct preparatory work including station marking, sign installation, and traffic control device deliveries. Construction work on the project is anticipated to begin on Monday night, July 9. Additional details on nightly and weekend restrictions will be provided prior to the start of physical work. Coordination will occur with the I-376 Parkway East project located between the Fort Pitt Bridge and the Edgewood/Swissvale interchange. The $2.34 million project includes milling and resurfacing the longitudinal centerline and edgeline joints on I-376 between the Edgewood/Swissvale interchange and Route 22 in Monroeville. The overall project will conclude in mid-October. The Lane Construction Corporation is the prime contractor. Join us for Tai Chi in the Park with Jon Wilson, our newest fitness offering for adults! This class runs from July 18 through August 22, 2018 from 7pm to 8pm. Pre-register for this six-week program by filling out the Registration form and returning it to Recreation at 2 Race Street, Edgewood, PA 15218. Pre-registration is $50, and drop-ins are $15 per class. If you drop in, be sure to come 15 minutes early to complete the registration form. All classes are held at Koenig Field, meeting in the Field House in cases of inclement weather. Be sure to wear comfortable, loose fitting clothing. This class is for adults ages 18 and over. If you have any questions, contact Jessica at office@edgewoodboro.com or 412-242-4824. Movie Night returns to Edgewood! July 23 - Monsters, Inc.
Activities will begin at 8pm with Skeeball courtesy of Scene 75, trivia begins at 8:30, and the movie showing will begin around 9pm (when it's dark enough!). Come hungry, because D’s Road Dogz food truck will be on-site providing delicious hot dogs and other treats! *Bring your lawn chairs, blankets and popcorn! Contact Jessica at 412-242-4824 or office@edgewoodboro.com with any questions. Edgewood Borough is participating in the 2018 Side Yard and Blighted Structure Program offered through Allegheny County. If you are interested in purchased a vacant or abandon property at a reduced cost, please see the attached fact sheet. If you have questions about a specific property or the program in general, please contact Edgewood Borough at 412-242-4824. Mayor Wilson has lifted the parking ban for the holiday weekend. Ticketing will resume on Wednesday, May 30th at 3 am. Edgewood Borough wishes everyone a happy and safe Memorial Day! Edgewood Borough Council will hold a public hearing on Monday, May 21st at 7 pm in Council Chambers, 2 Race Street, to hear public comment on the conditional use applications to operate bed and breakfasts at 120 Harlow, 33 McKelvey Avenue and 218 Elm Street. All are welcome to attend. This spring, a large Oak tree in Memorial Park fell during high winds. The Borough’s arborist was called in to the site, and determined that the tree was suffering from root rot, a fungus that infected the tree and caused the roots to become spongy. The roots, therefore, were not working to anchoring the tree into the ground. The arborist further informed the Borough that five other trees in Memorial Park were also suffering from extensive root rot, and could fall during high winds. At the request of the Shade Tree Committee, a second arborist was brought in to assess the trees and provide a second opinion. It was confirmed that all five trees did have extensive root rot, which is a “cancer” for trees. Given the location of these trees next to busy roadways, the situation became a public safety concern. The trees are being removed to prevent them from falling onto the roadways. Edgewood Borough Council values our urban forest, and is committed to its maintenance. Council will be working with the Shade Tree Committee to create a plan for replacement of the trees in Memorial Park. If you have any questions about Edgewood’s trees, please contact the Borough office at (412) 242-4824. Tball and Softball Registration has been extended through Sunday, May 20. There was an error which wasn’t allowing 6 year olds to sign up for Tball - please be aware, Tball is open to 5 and 6 year olds! Softball is open to 7-14 year olds. If you have any questions about using the online system, contact Jessica at the Borough Office at 412-242-4824 or office@edgewoodboro.com. The Edgewood Borough Community Services Committee will meet on Monday, May 14th at 7 pm in Council Chambers. The public is welcome to attend. Edgewood Borough has Belgian Blocks available for purchase by Borough residents. Click here for an order form. Blocks are available for pick up only. Street Sweeping resumes Wednesday, April 4, so please remember to move your vehicles to avoid ticketing! Street Sweeping days are noted on signage in Edgewood streets - so when street parking, please note the street sweeping dates for your area. Softball and Tball Registration now Open! Registration for 2018 TBall and Softball is now open until Monday, May 15. Tball is open to boys and girls ages 5-6 and softball is open to girls ages 7-13. Registration fee is $45.00. Play takes place at Koenig field through June and July. Complete the ONLINE Registration – (yes, registration is ONLINE this year!) HERE, before May 15 to register. If you would like to volunteer, please be sure to fill out the "volunteer" registration at this Link. For any other questions, contact Jessica in the administrative office at 412-242-4824 or Email: office@edgewoodboro.com. If you need to register with a paper form, they can be found in the Borough Office at 2 Race Street, Pittsburgh, PA 15218. Yoga in the Park is back again for 2018! Our first session of the year will be held Wednesdays from 7:30-8:30pm at Koenig Field from May 23 through June 27. You can pre-register for all sessions for $50 or drop-in to each class for $15 per class. Please make all payments payable to Yoga Instructor, Julie Straub. Click Here for the registration form. Wear loose-fitting, comfortable clothing and bring your own yoga mat. If you’re dropping in to the session, be sure to come 15 minutes early to fill out the registration form. If you have any questions, contact Jessica at office@edgewoodboro.com or 412-242-4824. You can also follow our Facebook page for announcements. We hope it will be a peaceful evening for your mid-week! Namaste! Join us for this annual children's event! Due to the unseasonable snow, this event has been postponed to Saturday, March 31. Children ages 2-10 are welcome to bring their own baskets to collect Easter Eggs at Koenig Field at noon. The Edgewood Borough Shade Tree Committee will meet on Thursday, April 12, 2018 at 7 pm in Council Chambers. All are welcome to attend. Join The Edgewood Shade Tree Committee and Nine Mile Run Watershed in planting trees in Edgewood on Saturday, April 28 from 9:00am -11:30am! For more information, visit NineMileRun.org, and register to volunteer by Clicking here! Edgewood Borough Council will hold a public hearing on April 2, 2018 at 7 pm in Council Chambers at 2 Race Street to hear a request for a conditional use. Location: Towne Centre Drive lot D-2. Applicant: Northpoint Development, LLC. Request for conditional use to operate self storage facility. Edgewood Borough Council will hold a public hearing on April 2, 2018 at 6:30 pm in Council Chambers at 2 Race Street to receive public comment on the request by Scene 75 entertainment center, LLC for an inter-municipal transfer of a liquor license to restaurant facilities within Edgewood Borough to be located at 1775 S. Braddock Ave. Wooden Bat Baseball Season Cancelled. Due to low registration numbers, the Wooden Bat Baseball league will not be going forward for the 2018 Season. We will be expanding the sport for 2019, so watch for registration information next winter! The Edgewood Shade Tree Advisory Committee will meet on Thursday, March 1st at 7 pm in Borough Council Chambers, 2 Race Street. The public is welcome to attend. The Edgewood Borough Council Pension Committee will meet on Tuesday, March 6th at 6:30 pm in Council Chambers, 2 Race Street. The public is welcome to attend. Registration for Wooden Bat Baseball is open until March 15, 2018! Boys and Girls ages 7-12 are able to play this FUN sport that plays at Koenig Field through April and May. (Softball and Tball WILL play as scheduled through the summer months). Each child will have one practice day and two games per week. Practice days will be the same from week to week, but games will rotate according to the Baseball schedule. Click Here to download the registration form. Call Jessica at 412-242-4824 with any questions about this new Youth Sports offering for Edgewood! Learn more about the Allegheny County Sanitary Authority’s plan to expand its North Side wastewater treatment plant at two public meetings on Tuesday, January 30, one at 10:30 a.m. and the other at 6:30 p.m. Both meetings will take place at ALCOSAN, 3300 Preble Avenue, Pittsburgh, 15233. A shuttle will be available to transport people to both sessions, beginning at 9:30 a.m. for the 10:30 a.m. meeting and at 5:30 p.m. for the 6:30 p.m. meeting. The shuttle will circulate to both Port Authority T-stations on the North Side, and it will return riders to those stops after the meetings. The content of the meetings will be identical. Please register in advance so everyone can be accommodated although registration is not mandatory. The plant expansion is a fundamental component of ALCOSAN’s Clean Water Plan. ALCOSAN is bound by agreements with federal, state and county regulators to reduce the volume of untreated overflows into the region’s rivers and streams. Doing so is required, and it is also the right thing to do. Please join us to learn more about this important plan for the future. Edgewood's Annual Progressive Dinner is Saturday, February, 24th! Deadline to sign-up is Sunday, February 11th. The Borough of Edgewood's parking ban has been lifted for Labor Day Weekend, beginning Saturday, September 1, at 3:00 am. Nightly ticketing will resume Tuesday September 4, at 5:00 am. As we dig out from the latest snow storm, Edgewood Borough wanted to remind our residents of a few tips to help us get through the winter. Registration will begin on February 1 for Boys and Girls Wooden Bat Baseball! Forms will be available here and in the Borough Office at 2 Race Street starting in February. Play will be held through April and May (with some rain dates in June) at Koenig Field. Registration fee will be $80. Click Here for a flyer with more information, or contact Jessica at 412-242-4824 or office@edgewoodboro.com with any questions. Join us for this great spring sport! Edgewood Borough Council will hold a committee of the whole meeting on Monday, January 8th at 7 pm in Council Chambers. Members of the public are welcome to attend. 2018 Parking Permits are now available for purchase at the Borough Office at 2 Race Street as of December 1, 2017. Visit our Parking Permit page on our website at: www.edgewood.pgh.pa.us/edgewood-overnightparking.htm for more details and for a printable application. Nightly ticketing will resume on Tuesday, January 2 at 3:00am, so be sure to pick up your permit to avoid New Year's Tickets! Call 412-242-4824 or email office@edgewoodboro.com with any questions. The Borough of Edgewood's parking ban has been lifted for the Christmas Holiday beginning Friday, December 22, at 3am. Nightly ticketing will resume in the new year on Tuesday, January 2, 2017 at 5am. Have a safe and happy holiday - and don't forget your new parking permits for 2018! Registration for Basketball is closed as of Friday, December 15, 2017. If you have any questions, contact Jessica at 412-242-4824 or office@edgewoodboro.com. Girls and Boys ages 6-14 are welcome to play, and there is no need to be an Edgewood resident to play with us. Registration fee is $60. Mail or drop off your completed forms at the Borough Building at 2 Race Street, Edgewood PA 15218 to register. We accept cash and check (but never mail cash!). After you register, you will need to come to the Edgewood Primary Gym on Wednesday, December 13 for Draft Night so you can be placed on a team. Draft times are according to age group - check the registration form for times. Play begins on January 2 and the season lasts until March 10, 2018. It’s a great way to stay active during those winter months! All practices and games are held at Edgewood Primary Gymnasium. Men's Basketball plays Thursday nights at Edgewood Primary School Gym starting December 2017. If you have any questions about the program, please call George Fuller at 412-247-1472. Click Here for the Registration form. Stop by the Borough Building at 2 Race Street to pick up your 2018 Parking Permit. Permits are $20.00 each for resident or visitor passes. Residents should be sure to have current registration and insurance information to present at time of purchase. Click Here for more information on Parking Permits. Get your 2018 permit early to avoid ticketing in the New Year! Click Here for the Parking Permit form. Call the office at 412-242-4824 with any questions. The 2018 adopted General Fund, Sewer Fund and Highway Aid fund budgets are available for review here. A public hearing to receive resident comment about the budgets will take place on Monday, December 4, 2017 at 7 pm in Council Chambers. The Borough of Edgewood will hold a public hearing regarding the 2018 Budget on Monday, December 4, 2017 at 7pm in Council Chambers at 2 Race Street, Edgewood PA 15218. The Borough of Edgewood's parking ban has been lifted for the Thanksgiving Holiday beginning Thanksgiving Day, November 23, at 3am. Nightly ticketing will resume Monday, November 27 at 5am. The Edgewood Borough Offices will be closed on Thursday, November 23rd and Friday, November 24th. Edgewood Borough Council will hold a budget meeting on Saturday, November 11th to discuss the Borough's 2018 finances. The meeting will begin at 8 am in Council Chambers, 2 Race Street Pittsburgh PA 15218. The meeting is open to the public, and all are encouraged to attend. Are you looking to learn more about why and how we should protect and conserve water here in your community? Throughout 2017, Nine Mile Run Watershed Association has hosted a series of free open houses to discuss and showcase water related topics over good brews. For each Water Talk, beer or coffee is provided from local partners to highlight that for a good drink, clean water is the main ingredient. At these events our staff members host interactive discussions regarding the actions you can take to contribute to a healthy watershed community. The Water Talks are held at the NMRWA office in Wilkinsburg. 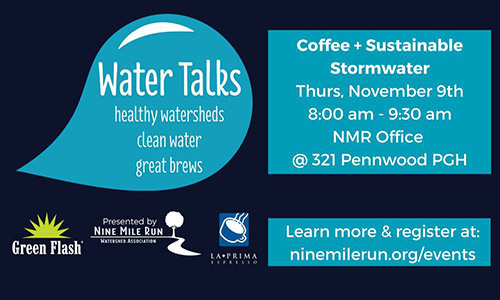 Join us for Coffee + Sustainable Stormwater, the final installment in our free, quarterly Water Talks series. Enjoy some great brews from La Prima while our Director of Policy & Outreach Mike Hiller discusses sustainable solutions for managing excess stormwater. Questions? Contact Mike Hiller at mike@ninemilerun.org or call at (412) 371-8779 ext. 121. Facebook event information is here. Registration begins on November 1, but feel free to register early! Girls and Boys ages 6-14 are welcome to play, and there is no need to be an Edgewood resident to play with us. Registration fee is $60. Mail or drop off your completed forms at the Borough Building at 2 Race Street, Edgewood PA 15218 to register. We accept cash and check (but never mail cash!). There is a late fee for registrations received after December 1. Edgewood Borough Council will hold a special meeting on Monday, October 23, 2017 at 7:30pm in Council Chambers at 2 Race Street, Edgewood, PA. The purpose of the meeting will be for the Mayor to break a tie for Resolution 2017-12. The Borough of Edgewood will present the following ordinance for final reading at its November 6 meeting at 7:30 pm at 2 Race Street, Edgewood, PA, 15218. AMENDING SECTION 200-6 OF ORDINANCE 1048. The Ordinance is available for public inspection in the office of the Borough Manager, 2 Race Street, Edgewood, PA 15218. You may also download a copy by clicking the following link: Edgewood Borough Ordinance 1061. Please be aware that leaf pickup is not possible on rainy or wet days. Do not place yard waste at the curb - the machine can only collect LEAVES. Branches and other debris can damage the machine. Leaves are collected in the Borough to protect our sewers and waterways from clogging and overflow. Leaf collection ends in mid-December, depending on weather and when the first snow arrives. Click here to download the 2017 Leaf Pickup Schedule. Keep our community healthy and get your vaccine this season! If you can’t make it to the Borough Building, you can view a list of free clinics in the area by downloading our flyer. Allegheny County Executive Rich Fitzgerald has been hitting the road to tour municipalities, and Edgewood was pleased to host the County in its first round of tours. On July 31st, Edgewood Borough Council led the County Executive and County staff members through the Borough. Council highlighted some of the things that make Edgewood a unique place to live and work, and showed off projects we are particularly proud of, including the Edgewood Train Station, green infrastructure rain gardens, and the newly installed Dog Run at Dickson Park. Council discussed Edgewood history, current intermunicipal cooperation with our neighbors, the active civic groups that call Edgewood home, and highlighted the work of Borough volunteers. All in attendance identified areas where future cooperation with the County is needed, particularly in reference to the Port Authority. Edgewood Council discussed how current bus stops could be updated, and looked at ways to improve access to public transportation. Edgewood Borough Council would like to thank Executive Fitzgerald for stopping to see all that Edgewood has to offer! We are eager to continue our excellent working relationship with the County in order to better serve our residents. On July 31, ALCOSAN launched its new website www.3riversproud.com. On this website, you can find information about the work and partnerships of ALCOSAN with local municipalities to protect our rivers and streams. You can also learn about how you can take action to implement the Clean Water Plan and find events in our community. Check out www.3RiversProud.com today! Saturday, July 29 is Coach Kip Day in Edgewood! To commemorate his 20 years of dedicated service as our beloved Softball Coach, Mayor Cook proclaimed Saturday, July 29 “Coach Kip Day” in Edgewood. We are so grateful for Coach Kip’s inspirational work in our neighborhood, and we hope he continues to mentor our young people for many years to come. Thank you, Coach Kip, for the amazing work you do! The Edgewood Shade Tree Committee will be meeting Wednesday, August 2, 2017 at 4pm in Council Chambers at 2 Race Street, Edgewood, PA 15218. This meeting is open to the public. Dickson Park Dog Run Nearing Completion! Improvements are finishing up for the Dickson Park Dog Run! Stay tuned for more information about its opening! (Please note that the Dickson Park Dog Run is not yet ready for visitors as of July 2017). Beginning July 1, 2017, Edgewood’s Real Estate Tax Collector, Maureen Smith, will have office hours on Tuesdays and Thursdays from 9am to 1pm. Please note the tax office will be closed August 7 through August 11. Soccer Registration open until Monday, August 14! It’s that time again! Edgewood Soccer 2017 registrations are open until Monday, August 14. Girls and Boys ages 4-14 are welcome to sign up - no need to be an Edgewood resident to play. Cost for registration is $60. Practices are one weekday evening and games are held Saturday mornings (coaches get to pick their practice day and times). Practices and games begin after labor day and end on October 28. All practices and games are held at Koenig Field. Click Here to download the registration form. Payment may be made in cash or check (please do not mail cash). We are always looking for more Coaches and Assistant Coaches! Please consider being a leader in this fun league by coaching or assisting! Please note: late registrations will only be accepted until Friday, August 18 along with a $10 late fee. As a service to its Planning Partners, the Southwestern PA Commission (SPC) has developed a Road Safety Audit program as part of its Transportation Operations & Safety planning efforts. An RSA is a proactive process that provides recommendations which can be implemented in stages as time and resources permit. What elements of the road may present a safety concern? The Edgewood Shade Tree Advisory Committee will meet on Thursday, February 1st at 7 pm in Borough Council Chambers, 2 Race Street. The public is welcome to attend. The Edgewood Borough Council Community Services Committee will meet on Tuesday, January 30th at 6:30 pm in Council Chambers, 2 Race Street. The public is welcome to attend. Mayor Cook has lifted the Borough’s parking ban for the 4th of July holiday, beginning at 3 am on Saturday July 1st to be reinstated at 3 am on Friday July 7th. Movie Night - July 10: Monsters, Inc.
Join us for the third Movie Night of the season on July 10 for Monster’s, Inc! 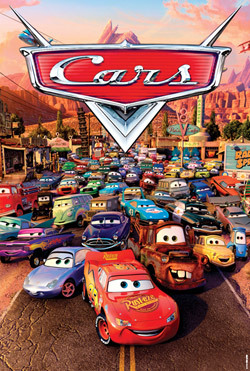 We begin the evening with fun Disney trivia at 8:30pm and the Pittsburgh Pizza truck will be on-site to provide $1 hot dogs, fresh pizza and pretzels for movie snacks. We’ll get the movie started once the sun sets – just like the drive-in! Join us for this great evening at Koenig! Download the Fact Sheet for more information! NMRWA Street Tree Inventory – Take the Survey! Nine Mile Run Watershed Association’s planning effort for the watershed’s trees is in full swing. A significant project within the Watershed Forest Master Plan is collecting street tree data, and NMRWA is utilizing ArborPro, a professional contractor, to collect this information in Edgewood. Look out for ArborPro's field technicians over the next couple of weeks. The data gathered will be immediately used to help inform the plan’s goals and recommendations. Equally as important, NMRWA wants to hear how residents feel about the trees in their neighborhoods. Please take 5 minutes to complete the survey online! The Edgewood Borough Shade Tree Advisory Committee will hold its first meeting on June 14, 2017 at 6:30 pm in Council Chambers at 2 Race Street Pittsburgh PA 15218. New Program Available: Yoga in the Park begins this summer! Sign up for Sunday morning or Thursday evening (or both!) Yoga in the Park at Koenig Field! We are proud to have Carrie MacDonald leading Sunday mornings and Cathy Reifer leading Thursday evenings beginning this June. Both sessions welcome yoga practitioners of all levels of experience, and a variety of ages. Participants must be 18 years of age or accompanied by an adult. Both sessions are six weeks. Pre-register for $50 or drop in for $15 per class. Pre-registration can save you over 40%! Click Here to download the registration form. Make checks payable to the instructor of the session of your choice. Pre-registration ends on Wednesday, June 7. Sunday session begin June 18. Thursday session begins June 22. Call 412-242-4824 or email office@edgewoodboro.com with any questions. The Borough of Edgewood is soliciting letters of interest from residents who wish to serve on the newly established Shade Tree Advisory Committee. The appointment is voluntary for a term of up to three years. The role of the committee is to advise Borough Council on matters of policy involving the preservation of street trees, to act as a resource for homeowners wishing to learn to care for their privately owned trees, and to promote tree planting throughout the Borough. As this is a newly formed committee, the Borough is looking for five volunteers to begin this important work. Please consider serving in this valuable role! Letters of interest can be sent to Rob Zahorchak, Borough Manager, at manager@edgewoodboro.com, or dropped off or mailed to the Borough Building, 2 Race Street Edgewood PA 15218 by May 5, 2017. Please indicate in your letter the length of term you would be comfortable serving, and any experience you have with urban forestry. Join your neighbors this Saturday for our annual Earth Day cleanup sponsored by the Edgewood Foundation. Volunteers meet with our organizer down at Koenig Field. Reflective vests, gloves, trash bags and light refreshments are provided to all. For more information, email cleanup@edgewoodfoundation.org or visit the Edgewood Foundation’s website at EdgewoodFoundation.org. Registration for 2017 TBall and Softball is now open until Monday, May 15. Tball is open to boys and girls ages 5-6 and softball is open to girls ages 7-13. Registration fee is $45.00. Play takes place at Koenig field through June and July. Complete the Registration Form (Click Here to Download) and return it to the Borough Office along with your registration fee before May 15 to register. For any other questions, contact Jessica in the administrative office at 412-242-4824 or Email: office@edgewoodboro.com. Join us for Edgewood Borough’s Annual Easter Egg Hunt! Edgewood's Annual Easter Egg Hunt will take place on Saturday, April 8 at noon at Koenig Field. Children ages 2 to 10 are welcome to bring their Easter baskets and collect as many eggs as they can find! We are happy to see this fun tradition continue throughout the years. Join us for a lovely day of fun! The Borough of Edgewood will present the following ordinance for final reading at its March 20, 2017 meeting at 7:30 pm at 2 Race Street, Edgewood, PA, 15218. AN ORDINANCE OF THE BOROUGH OF EDGEWOOD, COUNTY OF ALLEGHENY, COMMONWEALTH OF PENNSYLVANIA, ESTABLISHING A SHADE TREE ADVISORY COMMITTTEE, SETTING FORTH THE NUMBER OF COMMITTEE MEMBERS AND OUTLINING THE RESPONSIBILITIES OF THE COMMITTEE. The Ordinance is available for public inspection in the office of the Borough Manager, 2 Race Street, Edgewood, PA 15218. You may also download a copy by clicking the following link: Edgewood Borough Ordinance 1060. Join us for a discussion about H.H. Westinghouse - early Edgewood resident, Councilman, Burgess, inventor, business leader. Oh, and brother of famed industrialist George Westinghouse. In the Edgewood Club Living Room. Refreshments will be served. Program starts at 7pm. For more information, Click Here to visit the event page on Facebook. The Edgewood Historical Society will host a drop-in open house on Thursday, Feb. 16, at The Edgewood Club. We are looking to add new members in 2017 to help explore, preserve and promote the history of the borough and surrounding area. Stop by between 6:30pm and 8pm to socialize and learn more about the history of our beautiful neighborhood. On Friday, April 7, 2017 enjoy an evening of good food, drinks, and entertainment with your neighbors while supporting early education programs for Deaf and Hard-of-Hearing students in the Children's Center at the Western Pennsylvania School for the Deaf. Sponsorship opportunities and tickets for the event can be found online at: www.wpsd.org/support-us/an-evening-in-edgewood. We hope you can be a part of this wonderful evening! Business Casual or Casual attire. 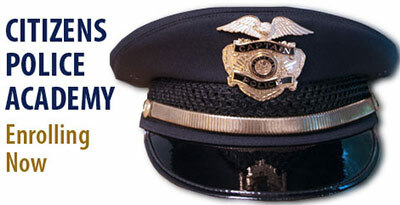 Citizens Police Academy Enrolling Now! The Edgewood Police Department is offering its Annual Citizens Police Academy. The program is designed to give the average citizen a better understanding of the criminal justice system, in particular, the role police officers play in the community. The Academy will begin Wednesday, April 5, 2017 and run consecutively every Wednesday through May 31, 2017. Classes will be held from 6pm-9pm in the Children's Center located a the Western Pennsylvania School for the Deaf at 300 East Swissvale Ave, Edgewood PA 15218. Applications can be picked up beginning February 3 through March 15 at the Edgewood Borough Municipal Building at 2 Race Street, Edgewood PA 15218. Please return the completed application no later than March 15, 2017. The application will include additional follow up instruction. All participants will be contacted via phone or email with additional information once selected. Please join us for a unique behind-the-scenes experience into the world of law enforcement. Potential students must be 18 years of age or older, and have never been convicted of a felony in the Commonwealth of Pennsylvania or elsewhere. All questions should be referred to the Program Coordinator, Officer Fred Livingston at 412-242-9994. The Woodland Hills School District is seeking volunteers for their new HUGS (Helping Unconditionally by Giving Support) program. Visit the Woodland Hills School District website: www.whsd.net for more information. This program is open to parents and community members. Download the Volunteers for Hugs flyer for details on how to register and training dates. The Boroughs of Edgewood and Swissvale will be holding a public meeting regarding the S. Braddock Avenue Pedestrian Improvement Project. The purpose of the meeting is to present the proposed project scope. In addition, Edgewood/Swissvale Boroughs and their consultants will be available to answer questions about the project. This meeting provides an opportunity for the public to provide feedback on the proposed scope of work. The proposed project involves the pedestrian improvements to South Braddock Avenue. The proposed project includes installing ADA compliant curbs, textured crosswalks, and rehabilitation of pedestrian traffic signals. **The public meeting location is compliant with the Americans with Disabilities Act (ADA). In addition, if you or an individual with whom you are familiar does not speak English as the primary language and who has a limited ability to read, write, speak or understand English desires to view these plans or if you require special assistance to attend the meeting or need additional information please contact the number above. Download the public meeting poster here. The Borough of Edgewood IS NOT AFFECTED by the PWSA flush and boil advisory. Edgewood’s water is provided by the Wilkinsburg-Penn Joint Water Authority, which does not have any connection to Pittsburgh city water. Edgewood’s water is not under advisory. If you have any questions about the advisory for our neighboring communities, visit their website at PGH2O.com! They have a lot of information and an interactive map of affected areas posted. Visit: www.pgh2o.com. On Tuesday, January 3, 2017 the Allegheny County Sanitary Authority will launch its Clean Water Assistance Fund to help families pay their ALCOSAN bills. The program will serve low-income residential customers in the 83 municipalities ALCOSAN serves. Ratepayers will receive a $30 credit on their bill, every three months. To learn more, download the Fact Sheet or contact the Dollar Energy Fund at 1-800-375-1388. For any questions regarding Republic Services trash and recycling pickup, CLICK HERE! This fact sheet contains a 2017 schedule, waste and recycling rules and a list of accepted and non-acceptable recycling items. The Borough of Edgewood's parking ban has been lifted for the Christmas Holiday beginning Christmas Eve, December 24, at 3am. Nightly ticketing will resume in the new year on Tuesday, January 3, 2017 at 5am. Have a safe and happy holiday - and don't forget your new parking permits for 2017! Edgewood Borough Council will hold a public hearing on the proposed 2017 budget. The public hearing will take place on Monday, December 5, 2017 at 7 pm in Council Chambers, 2 Race Street. Light Up Edgewood - This Friday! Friday, December 2, 2016, 7:00pm at Memorial Park, followed by the Edgewood Club. The first Friday of December is the evening that Santa always visits Edgewood! He will meet us at Memorial Park and light the Borough tree with his magic. After the Borough tree is lit, we will gather at the Edgewood Club for warm drinks, cookies, a traditional Christmas movie and a chance to visit with Santa himself! December 6, 2016 will begin Tuesday Trash and Recycling Pickup! To better serve our community, Republic Services will be changing pickup day to Tuesday mornings beginning December 6, 2016. Recycling pickup will be every other week, also on Tuesdays. December 6 and 20 will be recycling pickup days. Just as a reminder, please make sure you place your Trash & Recycling to the curb no LATER than 6:00 a.m. Tuesday morning. For additional information, contact Republic Services at 1-800-464-2120. The Borough of Edgewood's parking ban has been lifted for the Thanksgiving Holiday beginning Thanksgiving Day, November 24, at 3am. Nightly ticketing will resume Wednesday, November 30 at 3am. Men's Basketball plays Thursday nights at Edgewood Primary School Gym starting December 2016. If you have any questions about the program, please call George Fuller at 412-247-1472. Click Here for the Registration form. Edgewood Garden Club’s Holiday Greens are Now on Sale! Use this Order Form to order your Holiday Greens from the Edgewood Garden Club! Greens will be available for pickup Saturday, December 3 from 10a to 4pm. Payment is needed at time of order. Return completed forms and payment to Susan Jones by Monday, November 21. Susan’s contact information can be found on the order form. Happy Holidays! Basketball registration is now open from November 1 through December 7, 2016. Return this form and your registration fee to the Borough Office to register. “Draft Night”, or the night that teams are picked, will be held on Wednesday, December 14, timed according to age group (see the registration form for your time). Registration fee is $60, and open to boys and girls ages 6-14. Practices are held in the Edgewood Primary Gym. For more information, contact Jessica at office@edgewoodboro.com. Do you love the trees in Edgewood? Edgewood Borough Council is soliciting letters of interest from residents who wish to serve on the steering committee for the Nine Mile Run Watershed Association Urban Forestry Master Plan. With the guidance of Tree Pittsburgh, NMRWA will work with watershed communities and stakeholders to develop a master plan for the watershed’s forest. Utilizing community and stakeholder input, tree data, and professional expertise, this plan will be the guiding document for NMRWA’s Urban Forestry program, and will serve as a resource to watershed communities. If you have a special interest, expertise, or knowledge of trees and urban tree planting, or if you simply are a person who values and enjoys the Borough’s urban forest, please consider serving in this valuable role! Letters of interest can be sent to Rob Zahorchak, Borough Manager, at manager@edgewoodboro.com, or dropped off or mailed to the Borough Building, 2 Race Street Edgewood PA 15218 by November 11, 2016. Halloween Trick or Treating in the Borough of Edgewood will be held Monday, October 31 from 6-8pm. Be sure to stay on the sidewalks and wear reflective clothing or glow sticks. Have a spooky time! Due to weather, Hayrides and Crafts were cancelled for the Oktoberfest event on Oct. 1. So now, there’s another chance to join the fun! Join us on Saturday, October 22 at 6pm at the Koenig Field house for annual Hayrides around the Borough and fun crafts for kids of all ages. Share the event on Facebook! The Borough of Edgewood will hold a public hearing regarding the 2017 Budget on Saturday, November 12, 2016 at 9am in Council Chambers at 2 Race Street, Edgewood, PA 15218. Join the fun at Oktoberfest! Please join us for a family-friendly afternoon of beer, cider, and brats (lemonade and hot dogs for the kids) - Sponsored by the Edgewood Foundation. This year, we will also be featuring hayrides and crafts in the field house, courtesy of the Borough of Edgewood. We will be featuring a selection of seasonal beers and other tasty items from local companies. All proceeds raised go towards future community projects! Get your flu shot - not the flu! Vaccines are free-of-charge, are available on a first come first serve basis for residents 18 year of age or older through the generosity of the McKeesport Hospital Foundation, UPMC East, UPMC McKeesport, & UPMC Health Plan & Eastern Area Pre-hospital Services. Inluenza (Flu) vaccines contain the H1N1 vaccine. Flu shots will not be given to pregnant women in their first trimester. Click Here for a list of other Flu Clinic Locations! The scope of work includes spot in-place CIP lining, complete manhole to manhole in-place CIP lining, and in-trench excavation repair of existing sanitary sewers located at five different work areas located throughout Edgewood Borough. The estimated quantity of repairs is approximately 24 linear feet of spot lining, 2,660 linear feet of manhole to manhole full lining, pre/post repair CCTV, 3 new manholes, cleaning and television of approximately 1,500 linear feet of additional Borough sanitary sewers and all appurtenances and restoration for said construction. All work shall be constructed according to the Contract Drawings and Specifications which are on file at the office of the Owner and Lennon, Smith, Souleret Engineering, Inc., 846 Fourth Avenue, Coraopolis, Pennsylvania 15108-1522. Bids will be publicly opened and read aloud approximately at 11:00 AM on October 13, 2016 at the Borough Office located at 2 Race Street, Edgewood, Pennsylvania 15218. Pennsylvania prevailing wage rates apply. Proposals must be upon the forms furnished by the Borough. The bid must be accompanied by a certified check or bid bond in the amount of ten percent (10%) of the bid, made payable to the Borough to guarantee the bidder’s entrance into the contract if given the award. No bid bond shall be waived or returned because the Bidder has failed to or cannot comply with any requirements as set forth in the plans, specifications, or any applicable statutes of the State of Pennsylvania or any applicable municipal ordinances. The Borough reserves the right to reject any or all proposals and to waive any informalities in the bidding. No bid may be withdrawn for ninety (90) calendar days after the scheduled time for receipt of bids. Attention is directed to the fact that procurement is subject to all requirements of the Pennsylvania “Steel Products Procurement Act, Act No. 1978-3”; and for Contract value exceeding $25,000, the Pennsylvania Prevailing Wage Act (Act of 1961 P.L. 987), and The Public Works Employment Verification Act (July 2012) apply. The Borough shall (a) award the construction contract to the lowest responsible bidder therefore, or (b) reject all bids received within ninety (90) days of the date of bid opening; provided, however, that the Borough may, in its sole discretion, delay such award or rejection for up to one hundred twenty (120) days from the bid opening date until the Borough has received all required approvals from other governmental agencies. Bidders on this work will be required to comply with Title VI of the Civil Rights Act of 1964. Edgewood Youth Basketball is currently seeking a Volunteer Coordinator for the 2016-2017 season, which begins in January 2017. For more information, contact Jessica at office@edgewoodboro.com, or 412-242-4824. Our recreation league is very popular in the winter months, and provides neighborhood kids with a way to keep active during the wintertime! The Volunteer Coordinator is in charge of organizing games and teams, overseeing practices, monitoring equipment and generally keeping things running smoothly. Practices begin in early January, and games end at the beginning of March. Our kids love this league, but we need someone to keep it running! Contact Jessica today with any questions! 2016 Youth Soccer Registration is now closed. Registration for 2016 Fall Youth Soccer is now closed. If you have questions, please E-Mail: office@edgewoodboro.com. Soccer practices begin in September and end in October, and practices and games are held at Koenig Field in Edgewood. Boys and Girls aged 4 to 14 from any neighborhood are welcome to register. Registration fee is $60. Bring your lawnchairs, blankets and popcorn! 2016 Youth Soccer Registration is Now Open! Registration for 2016 Fall Youth Soccer is now open until August 18! Click Here for the Registration Form. All important information and dates are listed on the registration form. If you have questions, or would like to volunteer as a coach, please email office@edgewoodboro.com. Practice will begin in September and end in October, and practices and games are held at Koenig Field in Edgewood. Boys and Girls aged 4 to 14 from any neighborhood are welcome to register. Registration fee is $60. Please turn in completed forms and fees to the Borough Office at 2 Race Street, Edgewood, PA 15218. Mayor Cook has lifted the on-street parking ban for the 4th of July Holiday. The ban is lifted beginning Saturday, July 2 at 3 am. Ticketing will resume Tuesday, July 5 at 3 am. The Borough of Edgewood will present the following ordinance for final reading at its July 5, 2016 meeting at 7:30 pm at 2 Race Street, Edgewood, PA, 15218. ORDINANCE 1057: AN ORDINANCE OF THE BOROUGH OF EDGEWOOD, COUNTY OF ALLEGHENY, COMMONWEALTH OF PENNSYLVANIA, AMENDING SECTION 200-6 OF ORDINANCE 1048. The Ordinance is available for public inspection in the office of the Borough Manager, 2 Race Street, Edgewood, PA 15218. You may also download a copy by clicking the following link: Edgewood Borough Ordinance 1057. Edgewood Borough Council will hold a special meeting on July 5, 2016 at 7:00pm in Council Chambers at 2 Race Street, Edgewood, PA. The purpose of the meeting will be to hold a Public Hearing on Ordinance 1057: AN ORDINANCE OF THE BOROUGH OF EDGEWOOD, COUNTY OF ALLEGHENY, COMMONWEALTH OF PENNSYLVANIA, AMMENDING SECTION 200-6 OF ORDINANCE 1048. AN ORDINANCE OF THE BOROUGH OF EDGEWOOD COUNTY OF ALLEGHENY, COMMONWEALTH OF PENNSYLVANIA, AUTHORIZING THE COUNCIL PRESIDENT ON BEHALF OF THE BOROUGH OF EDGEWOOD TO ENTER INTO AN INTERGOVERNMENTAL COOPERATION AGREEMENT, OR AGREEMENTS WITH OTHER PARTICIPATING MUNICIPALITIES AND TAXING JURISDICTIONS OF ALLEGHENY COUNTY FOR THE PURPOSE OF FORMING, ESTABLISHING AND JOINING A LAND BANK TO BE KNOWN AS THE TRI-COG LAND BANK. The Ordinance is available for public inspection in the office of the Borough Manager, 2 Race Street, Edgewood, PA 15218. You may also download a copy by clicking the following link: Edgewood Borough Ordinance 1058. If you live near a vacant property in Edgewood Borough, there is now a new program available to help you turn the property into a side yard! For a limited time, Allegheny County will be accepting applications to acquire vacant properties at a reduced cost to the buyer. For more information, please download our Property Recovery Program Fact Sheet. While this program is always available to those wishing to purchase blighted or vacant properties in Edgewood Borough, the County’s fees will be waived for those accepted applicants that wish to acquire a side yard to their primary residence, and reduced to $1,400 for applicants proposing to rehabilitate a blighted structure. The Council of the Borough of Edgewood seeks qualified organizations with public sector pension plan experience to provide investment management services for the Borough’s pension plans. Submission of proposals are due by 4:00 P.M. on July 29, 2016. All interested firms and corporations can download the RFP at this link: Request for Proposal. Copies can also be obtained at the Edgewood Borough Municipal Offices at 2 Race Street, Edgewood PA 15218 between 8:30 am and 5:00 pm, Monday through Friday. Proposals must be received at the Borough Municipal Offices on or before the due date in order to be considered. The Edgewood Foundation is sponsoring the Brinton Road Clean-Up this Saturday from 9am - 12pm. All supplies, including gloves, safety vests, and snacks will be provided. Jim Sismour is in charge of the event, and he'll be in the parking lot of the old Holiday Inn at 9am. For more details, visit the Foundation website at edgewoodfoundation.org. Pig Out Edgewood has been cancelled due to lack of sign-ups. The Foundation will see you at Community Day! Mayor Cook has lifted the on-street parking ban for the Memorial Day Holiday. The ban is lifted beginning Friday, May 27 at 3 am. Ticketing will resume Tuesday, May 31 at 3 am. The Borough of Edgewood will present the following ordinance for final reading at its June 6, 2016 meeting at 7:30 pm at 2 Race Street, Edgewood, PA, 15218. The Ordinance is available for public inspection in the office of the Borough Manager, 2 Race Street, Edgewood, PA 15218. You may also download a copy by clicking the following link: Edgewood Borough Ordinance 1056. Registration for 2016 TBall and Softball is now closed. Thank you to all who have registered and volunteered for this great league! Edgewood Council Committee of the Whole will be meeting Monday, May 9, 2016 at 6pm in Council Chambers at 2 Race Street to discuss traffic calming. Council Committee of the Whole meetings are open to the public and citizens are encouraged to attend and observe the meetings. No official Council action will be taken at this meeting. Please contact Rob Zahorchak at manager@edgewoodboro.com with any questions. Take the PUP (Pick Up Poop) Pledge to clean up after your dog, and get a special prize for your pooch! Cleaning up your dog's doo not only makes for a nicer neighborhood, but helps keep our rivers and streams clean! Stop in the Borough office to pick up a prize, or take the pledge right now on Alcosan’s website: www.pups4cleanwater.com. The Borough of Edgewood Public Works Department is now accepting applications for Part-Time Summer Help. Applicants must be at least 18 years of age and have a valid Pennsylvania driver’s license. Duties will include: mowing grass, pruning trees and hedges, planting and watering flowers, cleaning park facilities and clearing debris from streets. Completed applications may be sent to Rob Zahorchak, Borough Manager, at Manager@EdgewoodBoro.com or mailed to 2 Race Street, Edgewood, PA 15218 by May 6, 2016. Street Sweeping Resumes Weds, April 6! Street Sweeping Season will resume Wednesday, April 6, so please remember to move your cars to avoid ticketing. Saturday, April 2nd, 11:00am – 1:00pm is the Spring Parkway Interchange Litter Clean-up. Volunteers will meet in the parking lot near the entrance to Frick Park by CLASS (near west-bound on-ramp from S. Braddock). Help us keep the community beautiful! Please wear sturdy, comfortable shoes. RSCA will provide orange vests, gloves, and trash bags. For more information, Email the Regent Square Civic Association. Mayor Cook has temporarily lifted the on-street parking ban for the Easter Holiday. The ban will be lifted from Thursday, March 24 at 3 AM and will remain lifted until Monday, March 28 at 3 AM. Allegheny Snow Angels matches neighbors with neighbors to shovel the walks of those who are unable to do this on their own. Volunteers impact lives in our community by ensuring our more vulnerable neighbors continue to have access to essential services such as home-delivered meals and medications during the harsh winter months. To find out how to register for the program, call the intake line at 412-863-5939. To register to become a Snow Angel, register online at AlleghenySnowAngels.org. Allegheny Snow Angels is brought to you through Family Services of Western Pennsylvania, In Service of Seniors Pittsburgh and North Hills Community Outreach. PLEASE NOTE: Edgewood's trash collection day is now Friday. Trash should be placed at curbside no earlier than 6pm Thursday nights. Trash collection day will now be Friday. Recycling pickup will be every other week along with trash pickup – the first recycling pickup will be January 8, 2016. For all the details regarding acceptable containers, items not collected, and a printable collection schedule, please click this link: Republic Services Trash Collection Information. We look forward to our new partnership with Republic Services! The Borough of Edgewood's parking ban has been lifted for Christmas and New Year's holidays, beginning December 23, 2015 at 3:00 am until January 4, 2016 at 5:00 am. Nightly ticketing will resume Monday, January 4 at 5:00 am. The Allegheny County Department of Parks is again offering its Annual Christmas Tree Recycling Program this holiday season. Residents of the county can drop off their Christmas trees beginning on Saturday, December 26, 2015 through Saturday, January 16, 2016 at all nine regional parks during regular hours of operation (dawn to dusk). All lights, decorations, tinsel and stands must be removed from trees prior to drop-off. The trees will be mulched and used in Allegheny County’s nine regional parks. For more information: Department of Parks 211 County Office Building - 542 Forbes Avenue - Pittsburgh, PA 15219 - Phone (412) 350-7275 - Fax (412) 350-2682. The Edgewood borough 2016 Proposed Budgets are available for review. Please visit our Annual Budgets page for more information. January 1st is a Friday, and also a holiday, so the first collection will be Saturday, January 2. General questions can be answered by Republic Services at 1-800-464-2010 Monday through Friday, 8am to 5pm. For all the details regarding acceptable containers, items not collected, and a printable collection schedule, please read this flyer: Republic Services Information (Acrobat Reader required.). We look forward to our new partnership with Republic Services! Please visit our Recycling and Refuse page for more infomation. The Borough of Edgewood's parking ban has been lifted for Thanksgiving Weekend, beginning Thursday, November 26, at 3:00 am. Nightly ticketing will resume Monday, November 30, at 5:00 am. View our overnight parking permit page for more information on applying for 2016 on-street parking permits. Registration for 2016 Youth Basketball is now closed. Basketball registration typically begins just after Thanksgiving and the first practices are held in the first week of January. If you have any questions about this sport, email office@edgewoodboro.com for more information. 2016 Men's Basketball Registration Now Open! Registration for 2016 Men’s Basketball is now open. Send the completed registration form and fee to: Borough of Edgewood Recreation, 2 Race Street, Pittsburgh, PA 15218. Contact George Fuller at 412-247-1472 for more information. The Borough of Edgewood will hold a public workshop to discuss the 2016 Budget on Saturday, November 7, 2015 from 8 am to 12 noon. The workshop will be held in Council Chambers at 2 Race Street, Edgewood, PA.
Stop by the Koenig Feild & Fieldhouse Saturday, October 17 at 6-10pm: for crafts, cider, and neighborhood hayrides! For more inforamtion about this years Fall Festival, view our flyer here. Leaf Pickup is set to begin on October 19, so long as there has not been recent rain. See the below schedule for your pickup day. Registration for 2015 Fall Youth Soccer is now closed. Thank you to all who have registered and volunteered for this great league! The Borough of Edgewood will be holding a public meeting on Wednesday, August 12, 2015 at 6:30pm in Council Chambers to discuss the Master Plan for Dickson Park, and hear what our residents would like to see in the park. We’d like to hear your thoughts and ideas for Dickson Park! The Borough welcomes your ideas and insight on improvements to Dickson Park – please come and share your opinions. If you have any questions about this meeting, email Borough Manager Rob Zahorchak at manager@edgewoodboro.com. The Borough of Edgewood will present the following ordinance for final reading at its June 15, 2015 meeting at 7:30 pm at 2 Race Street, Edgewood, PA, 15218. ORDINANCE 1053: TRANSIENT RETAIL BUSINESSES. AN ORDINANCE OF THE BOROUGH OF EDGEWOOD, COMMONWEALTH OF PENNSYLVANIA, AMENDING ORDINANCE NO. 856 PROVIDING FOR THE REGULATION AND LICENSING OF TRANSIENT RETAIL BUSINESS WITHIN THE BOROUGH OF EDGEWOOD; REQUIRING PERSONS DESIRING TO ENGAGE IN TRANSIENT RETAIL BUSINESS TO OBTAIN LICENSE; AND PRESCRIBING PENALTY FOR VIOLATIONS. The Ordinance is available for public inspection in the office of the Borough Manager, 2 Race Street, Edgewood, PA 15218. You may also download a copy by clicking the following link: Edgewood Borough Ordinance 1053. We would like to remind our residents to please keep the doors and windows of their homes and vehicles locked! It can be easy to forget this simple step in the summer months, but please help to keep our community safe by locking up your home and cars. More information on this program can be found by visiting: http://www.alleghenycounty.us/economic/residents/vacproprecov.aspx.We encourage you to apply for this exciting program! The Borough of Edgewood Public Works Department is now accepting applications for Part-Time Summer Help. Applicants must be at least 18 years of age. Completed applications may be sent to Rob Zahorchak, Borough Manager, at Manager@EdgewoodBoro.com or 2 Race Street, Edgewood, PA 15218. Edgewood Borough's proposed 2015 General Fund Budget and Sewer Fund Budget are now available for review. Please visit our Annual Budgets page for more information. Visit our News Page for more articles and announcements.